I said that I wanted to bake my way through this chocolate cookbook, and I totally mean it. The cake recipe used for both the gateau forestiere and the jungle cake was from that book, as is the following recipe. It's wonderful. I prepared this mixture in advance, but we ended up having a super hot weekend and so on the night I constructed this for dessert, the vanilla layer began melting all over the place. 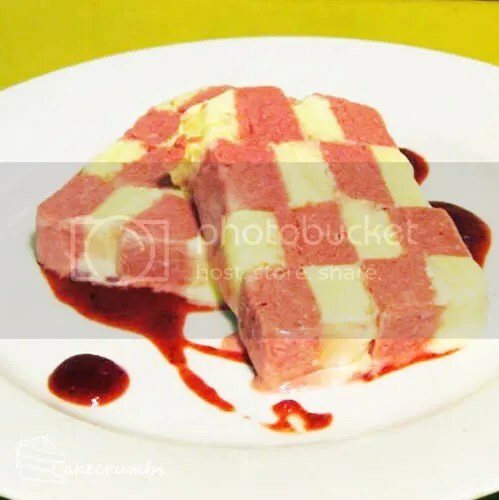 So there went my grand plans of having a perfectly chequered parfait. But what it's lacking on the aesthetic side it certainly made up for it in taste. This recipe gives you the freedom to choose your favourite berry. I used strawberry for both the parfait and the sauce. I also sieved out the seeds for a nicer texture. Alternatively, you could prepare two berry layers (such as raspberry and blackberry) if you want a multi coloured/flavoured parfait. 1. Cover base and side of two 8x26cm bar tines with plastic wrap or foil. If using frozen berries, thaw complete. Combine chocolate, cream and egg yolks in a medium bowl; mix well. In a separate bowl, whip extra cream until soft peaks form. Gently fold into chocolate mixture. Best egg whites in clean, dry bowl with electric beaters until soft peaks form. Using a metal spoon gently fold egg white into chocolate mixture. Divide evenly between prepared bar tins. Smooth surface with flat-bladed knife. Cover; freeze until firm. Process berries until smooth. Combine in medium bowl with sugar, chocolate, cream and egg yolks; stir cream until smooth. Beat extra cream until soft peaks form; gently fold into chocolate mixture. Best egg whites in clean, dry bowl with electric beaters until soft peaks form. Using a metal spoon gently fold egg white into chocolate mixture. Divide evenly between prepared bar tins; spread evenly over white layer. Smooth surface with flat-bladed knife. Cover; freeze until firm. Turn one mousse bar onto a work surface (you may have to loosen with a flat-bladed knife). Working quickly, cut lengthways into 4 even slices. Turn two of these slices upside down, alternating order. Brush surfaces with egg white; place upside don slices on remaining slices to form chequerboard pattern. Return to freezer while preparing second bar in the same manner. Turn both bars onto work surface, one of them upside down. Brush tops with egg white, join bars together. Cover tightly with plastic wrap, press bars together. Rreturn to freezer for another hour. Serve with berry sauce. Blend or process berries, sugar and water until smooth. Add enough water to make desired pouring consistency. I have nooo idea how mine kept ending up on your plate. No idea at all. My sources tell me Tobias probably did it.